Find the smile you've always wanted on your terms. Do you find yourself hiding your smile when speaking or taking photos? Are you looking for ways to achieve a beautiful, healthy smile with minimal interruptions to your daily life? At Dental Care Center in Mitchell and Kimball, SD, Drs. 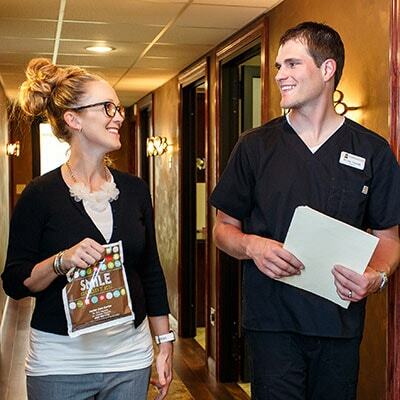 Eric and Jennifer Veurink are proud to serve Invisalign. Why are People in Kimball Choosing Invisalign Over Metal Braces? Invisalign does all the hard work for you. With braces, you have limitations on what you can eat and take proper care of your teeth. However, Invisalign uses removable aligners allowing you to eat your favorite foods while keeping up with your brushing and flossing habits. Too often, patients avoid orthodontic treatment because they do not want to undergo braces and deal with pokey wires and metal brackets. 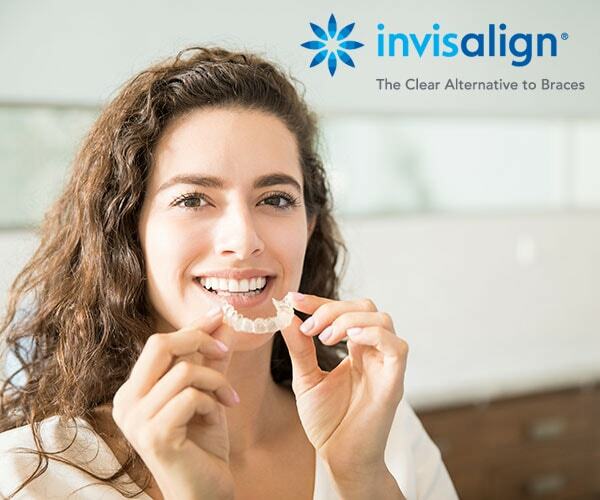 Invisalign is customized to your smile with clear aligners that are comfortable to wear. You’re never too old to change your smile. Invisalign is virtually invisible, so no one has to know you’re receiving orthodontic treatment. Plus, we can do this orthodontic solution for teens and adults. While the time to complete treatment varies from case to case, you’ll start seeing your smile change almost instantly. The clear aligners allow you to see the progress of treatment, creating that much more excitement for the final results. Why choose Drs. Jennifer and Eric Veurink? 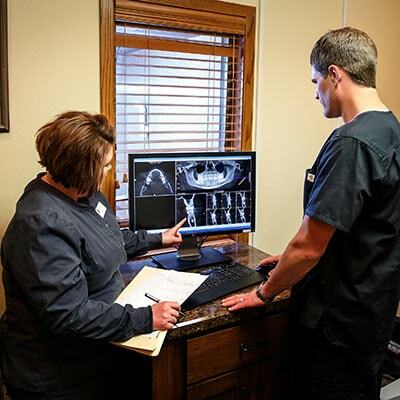 We believe you should know all of your options to help you make the best decisions for your smile. Our promise to you is we will always listen to your needs and never pressure you into doing dental treatment. We’re here for you. Investing in a new smile can be nerve-wracking. We can help take that uneasiness away with Invisalign. For your benefit, we’ll create a 3D video of what you can expect with the process and get a preview of your new smile to ensure you will love the final results. We’ll do what it takes to accommodate your needs. Whether you have questions about your dental insurance or are experiencing dental anxiety, talk to us because we’re confident in finding a solution that works for you. P.S: Your Invisalign consultation is on us! Consult our frequently asked questions! Don’t see what you’re looking for? No worries! 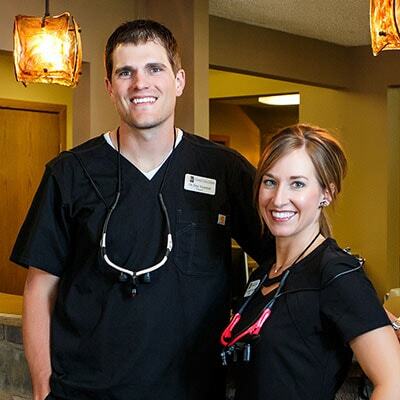 Just give us a call at one of our dental offices in South Dakota! It depends on your needs and goals. We’ll work together to come up with a plan and when we review the 3D plan together, you will see how long treatment will be. Does my insurance cover any of the cost? This all depends on your individual insurance plan, but our team will help you navigate through this. Just give us a call at one of our offices to schedule a complimentary consultation. We’ll start with a free consultation. The next step is taking records of your teeth, which could include photos, x-rays, and impressions. Then, we’ll create a 3D video and will watch together what to expect with your treatment plan before committing to treatment! We believe this step is crucial because we want you to love your new smile! Once approved and the aligners are manufactured, it’s time to get the attachments on the teeth and start the aligners. The attachments are tooth-colored! Over the course of the next few weeks, your teeth will move until we get to the final result. We then remove the attachments, polish the teeth, and you will have clear retainers to wear for six months full-time. After the six months, you’ll only need to wear your retainer at night for a lifetime. Yes! Your trays can be used with our Zoom! Take-home teeth whitening gel, so you can whiten your smile while getting them straightened too! Schedule your free consultation with our doctors today!